The Project AWARE Doxa SUB is a limited edition of the Doxa SUB 1000T that features the Project AWARE logo on the dial. The watch was created through a partnership between Doxa and Project AWARE in 2008 and is intended to promote awareness of, and raise funds for, Project AWARE and its work. A portion of every sale is donated to Project AWARE to benefit numerous conservation initiatives including underwater cleanup and marine debris prevention; coral reef conservation; monitoring and data collection; shark education, reporting and conservation; improved management policies and marine protection efforts; and environmental training for divers and educational programs for children. 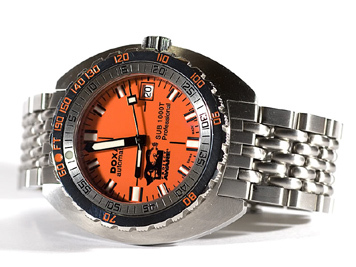 Only 92 Project Aware Doxa Subs were manufactured, in commemoration of the year 1992 when Project AWARE was founded. The watch may be worn to a depth of 1000 meters.